Drip free nozzles with filling range of 250ml to 20ltr, with drip tray for accidental drip. Non contact electronic sensor to ensure “no bottle no fill” system. Mitsubishi make plc system with 7” Touch screen and VFD control of C.G. make for conveyor speed control. German flow meter for better repeatability of 0.05%. Having in built non liquid contact sensor for measuring rotation of flow meter. And other contact parts in Stainless steel AISI 304 quality. Body frame made up of Mild steel with Powder coating. Capable of automatic intake of empty bottles / container on to the filling station and discharge after filling bottles with the help of stop and release lever pneumatically operated. Fast flow and fine flow system for better accuracy, interval can be steed form PLC, Volume would be set individually for each nozzle with a increment of 1ml. Neck entry system so that the nozzle enter inside the container before filling to avoid spillage. 16 feet conveyor with 6 inches stainless steel slats and suitable for filling 2 to 5 ltrs container along with electric motor for main drive and conveyor reduction gear box and variable frequency drive. Pneumatically operated Nozzle Up-Down movement & stopper Gates for bottle entry and exit. Adjustment can be made without interrupting filling sequence. Manual valve on bypass line of pump. In built memory to store 25 filling setting data. As flushing system is given the product change over time is 15 to 20 minutes. As setting of the volume is through PLC product change time is 15 to 20 minutes. To make it faster we have provided with in built memory which can store and recall whenever required. The Main system can be explained with the normal gear system model diagram.Where bottom is the suction and top is the discharge.The discharge is connected with the positive shut nozzle which when opens the Spur Gear flow meter starts rotating due to the flow of oil pumped through the pump given with the machine and the sensor mounted on flow meter starts counting which gives feedback to the PLC about the volume dispensed. Volume calibration at different speed. Volume calibration of pulses with the material dispensed. 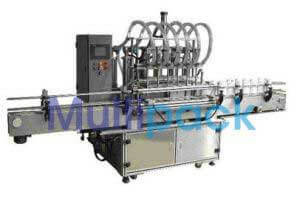 Than slow speed for high accuracy and spillage control. The data can be entered inside plc in following format. The machine will have an online display of process.